Beautiful Black Obsidian from the volcanic bowels of Mother Earth. This is a very popular stone and used from ancient times in Shamanic healing rites. 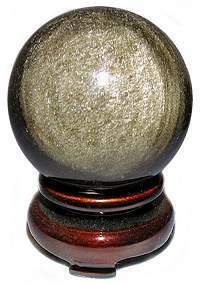 These Obsidian spheres have a flawless finish with no cracks, range from 55mm-75mm or 2 1/4" to 3" diameter. They are from Mexico, which is the best source for high quality Obsidian. The medium Fancy Oriental Rosewood Stand is sold separately. Sheen Obsidian is the most captivating of gazing stones, because of the sensational shine. This natural volcanic glass has been used by shamans to reveal secrets for centuries. Beautifully polished high shine 2" Spheres from Mexico. The Oriental Rosewood Stand is sold separately. Sheen Obsidian is the most captivating of gazing stones, because of the sensational shine. This natural volcanic glass has been used by shamans to reveal secrets for centuries. Beautifully polished high shine 3" - 3 1/2" Spheres from Mexico. The Rosewood Sphere Stand is sold separately. Rainbow Obsidian is a classic gazing stone. Believed to bring Love and Light into one's life. What secrets will it reveal? These high shine 2 3/4" - 3 4/5" Rainbow Obsidian spheres have an iridescent multi-hued bull's-eye on each side and are from Mexico, the best source of high quality Obsidian. 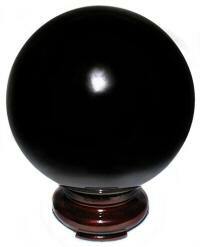 The Rosewood Sphere Stand is sold separately. Beautiful Black Obsidian from the volcanic bowels of Mother Earth. This is a very popular stone and used from ancient times in Shamanic healing rites. 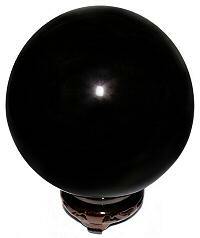 These Obsidian spheres have a flawless finish with no cracks, range from 85mm-90mm or 3 1/2" to 3 2/3" diameter. They are from Mexico, which is the best source for high quality Obsidian. The medium Fancy Oriental Rosewood Stand is sold separately. Beautiful Black Obsidian from the volcanic bowels of Mother Earth. This is a very popular stone and used from ancient times in Shamanic healing rites. 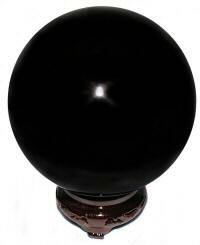 These Obsidian spheres have a flawless finish with no cracks and are 100mm or 4" or more in diameter. They are from Mexico, which is the best source for high quality Obsidian. The medium Fancy Oriental Rosewood Stand is sold separately. Beautiful Black Obsidian from the volcanic bowels of Mother Earth. This is a very popular stone and used from ancient times in Shamanic healing rites. 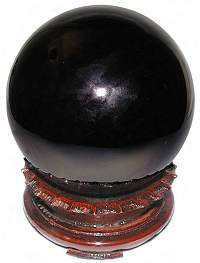 These Obsidian spheres from Mexico have a flawless finish with no cracks, range from 125mm to 140mm or 5" to 5.6" diameter. Mexico is the best source for high quality Obsidian. The Large Oriental Wood Stand is sold separately. 120mm or 4 3/4" Sphere - 5lbs 2ozs. Beautiful Black Obsidian from the volcanic bowels of Mother Earth. This is a very popular stone and used from ancient times in Shamanic healing rites. 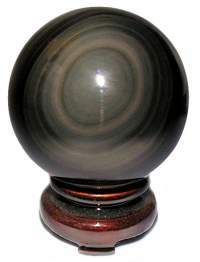 This Obsidian sphere has high polish with no cracks is 145mm or 5 3/4" diameter and from Mexico. The Large Oriental Wood Stand is sold separately. Beautiful Black Obsidian from the volcanic bowels of Mother Earth. This is a very popular stone and used from ancient times in Shamanic healing rites. 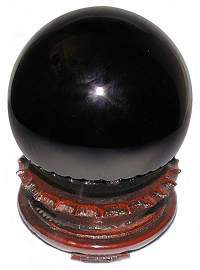 This Obsidian sphere has a high polish with no cracks, is 150mm or 6" diameter and is from Mexico. Mexico is the best source for high quality Obsidian. The Large Oriental Wood Stand is sold separately. 150mm or 6" Sphere - 10lbs 4ozs. Beautiful Black Obsidian from the volcanic bowels of Mother Earth. This is a very popular stone and used from ancient times in Shamanic healing rites. These Obsidian spheres from Mexico have a flawless finish with no cracks, range from 170mm to 190mm or 6 3/4" to 7 1/2" diameter. Mexico is the best source for high quality Obsidian. The Large Oriental Wood Stands are sold separately. Beautiful Black Obsidian from the volcanic bowels of Mother Earth. This is a very popular stone and used from ancient times in Shamanic healing rites. 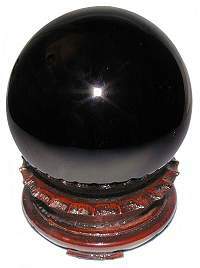 These rare extra large Obsidian spheres have a flawless finish and come from the finest lapidaries in Mexico. Mexico is the best source for high quality Obsidian. The Jumbo Rosewood Oriental Stand is no longer available. Beautiful Obsidian from the volcanic bowels of Mother Earth. This is a very popular stone and used from ancient times in Shamanic healing rites. 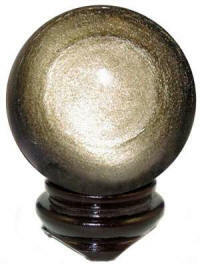 Please call to special order huge Black, Rainbow and Gold or Silver Sheen Obsidian spheres. 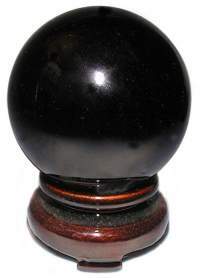 These rare extra large Obsidian spheres have a flawless finish and come from the finest lapidaries in Mexico. Mexico is the best source for high quality Obsidian. The Jumbo Rosewood Oriental Stand is no longer available.